On Mexico’s Pacific coast, the endemic Green Turtle or tortuga verde (Chelonia mydas) has been taken off the “endangered” list and had its status reclassified as “threatened”. Despite the success of conservation efforts in Mexico, green turtle remains on the worldwide endangered list, to which it was first added in 1978. For details of Mexico’s conservation efforts with respect to sea turtles, see Protecting Mexico’s endangered marine turtles. The global population of green turtles, which can wiegh up to 200 kg and live as long as 80 years, has now been divided by wildlife experts into 11 distinct sub-populations, allowing some flexibility in approaches to their management. 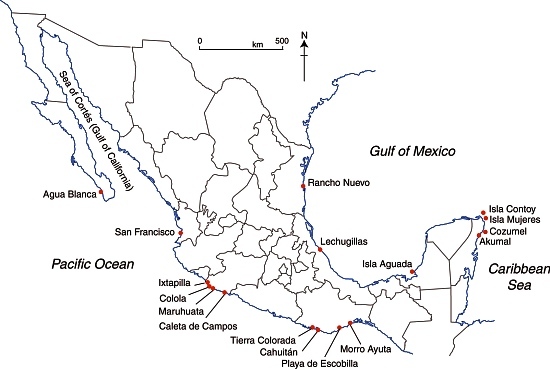 Selected marine turtle nesting beaches in Mexico. Meanwhile, in Mexico’s arid northern interior in the Chihuahuan desert, biologists have reported a marked upsurge in the numbers of the very much smaller Bolson tortoise. The Bolson tortoise (Gopherus flavomarginatus), native to this part of Mexico, is often referred to as the Mexican giant tortoise, but grows only to about 50 cm in length, with a weight of around 18 kg. It had been under threat due to local people hunting it for food, and due to shifting weather patterns. The tortoise is one of the various endangered species inhabiting the Bolsón de Mapimi, the desert basin that straddles the borders of Durango, Coahuila and Chihuahua. Conservation efforts in the area have focused on ensuring that local people have an alternative source of meat (cattle in this case) and appreciate the value of preserving their native tortoises. Local communities have been given grants to help with reforestation projects, environmental monitoring and maintaining a small museum for visitors.